Consider this week’s meeting the Winos version of Van Halen’s final concert with David Lee Roth on lead vocals before Sammy Hagar took over. As we announced at our Vins du Sud-Ouest meeting two weeks ago, I’ll be scaling back my involvement with the LA Winos and turning over day-to-day responsibilities to the eminently capable Xander Snyder, who will henceforth be moderating all of our weeknight meetings. Xander’s out of town for a few weeks this month, however, so I thought I’d sneak in one last night of hosting duties before officially passing the baton. As I’ve found myself particularly enamored of Italian wines lately, I thought it might make sense to hold a tasting of bottles hailing from one of Italy’s premiere wine regions, Piedmont (or Piemonte), a mountainous province in the northwest of the country which borders France and Switzerland. Piedmont is home to numerous esteemed grape varieties, and many of these have been adopted by New World producers as well. To add an international dimension to Wednesday night’s tasting, we’ll be including both Piedmontese wines and wines made in the Western Hemisphere using Piedmontese grapes. 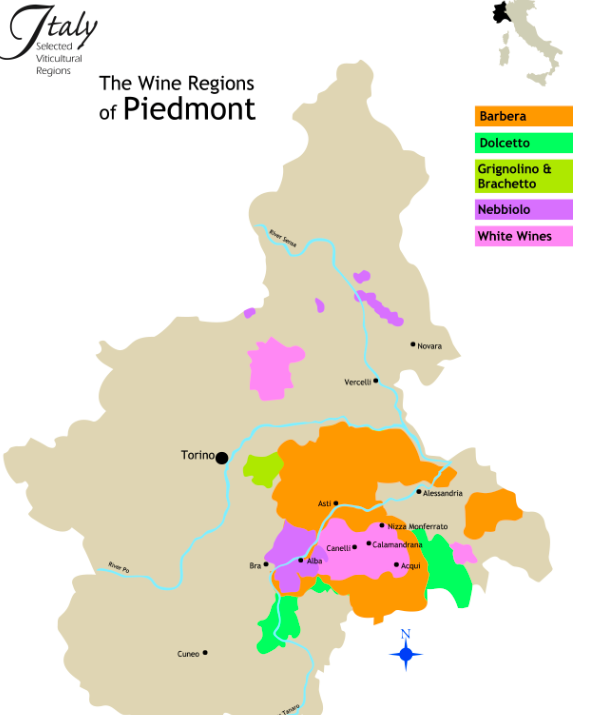 Whites: Piedmont is the home to a number of distinctive and diverse white grapes. One of the most famous Piedmontese whites is Gavi, made from the Cortese grape and grown around the village of Gavi in the eastern part of the region. (Cortese is also known colloquially as “Gavi,” so wines from the vineyards immediately around the village are confusingly called “Gavi di Gavi.”) Arneis is another local star; compared to many Italian whites, Arneis offers low acidity and strong fruit-driven flavor profiles. If high acidity is more your speed, try an Erbaluce from the northern part of the region, especially from the Caluso zone. Reds: Piedmont’s red grapes produce some of the most celebrated wines in Italy. Chief among these is Nebbiolo, which forms the basis of the world-famous Barolo and Barbaresco, a pair of ageworthy wines that are austere and tannic when young. Lower in tannin is the Barbera grape, the most widely-planted red in Piedmont, which produces engaging wines with great depth of flavor. The third significant Piedmontese red is Dolcetto — “the little sweet one,” a name which refers to the wine’s approachable nature rather than its sugar levels. Made into a light-bodied, slightly bitter wine meant to be consumed young, Dolcetto is a perfect daily drinker, and pairs happily with northern Italian cuisine. Numerous examples of Nebbiolo, Barbera, and Dolcetto are produced in California (and elsewhere in the New World). If you’re interested in trying a more obscure Piedmontese red, seek out a Bonarda, or maybe a Ruché. There’s also Brachetto — an aromatic, light-bodied red grape made into low-alcohol still wines (and also a sparkling red known as Brachetto d’Acqui). The map at left is worth checking out. It’s sort of problematic, though, because it seems to imply that only one grape variety is planted in the specific areas it outlines. Naturally, this is ridiculous, as numerous varieties sometimes coexist within a single vineyard. 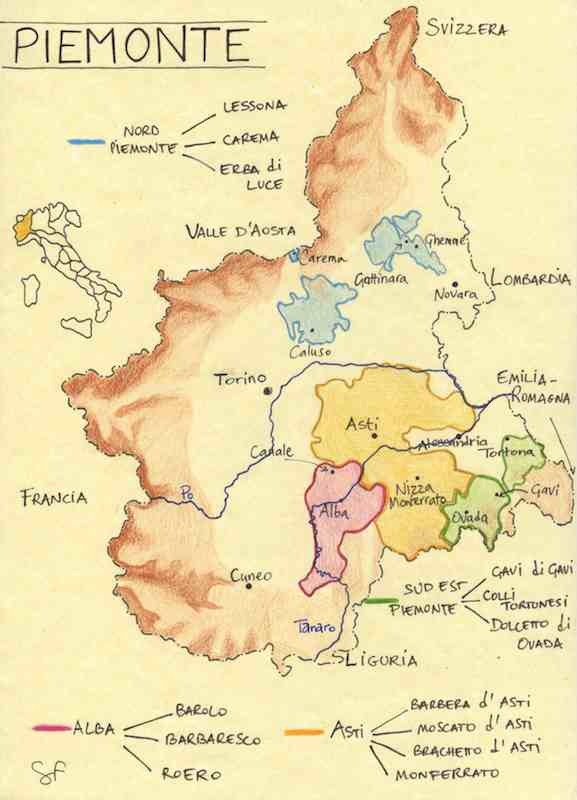 At the broadest of levels, however, it does offer a somewhat accurate road map of which grapes predominate in what part of Piedmont. Maps notwithstanding, feel free to bring a bottle of wine made from any of the grapes listed in bold above. Or, if you’re feeling daring, dig deeper — Piedmont has dozens of native varieties that get imported only in small quantities. As always, you’re welcome to bring a nice crisp $10 bill in lieu of a bottle. We’ll be meeting at Andrew and Rachel’s place in Echo Park, and this week’s meeting starts at 8pm. The RSVP system functions like this: if you want in, you click on this link and tell me so (don’t forget your full name, e-mail address, and a cute message conveying to me your intentions), and I’ll send you a confirmation e-mail with the address. Once you’ve received your confirmation e-mail, go find an interesting bottle of wine from Piedmont (or from elsewhere, as long as it’s made from a Piedmontese grape) — or simply bring ten dollars. Can’t wait to see you ebullient youngsters on Wednesday at 8pm.